Fast cycle times, efficient space utilization and simple operation are "must-have" requirements for spot welding operations. 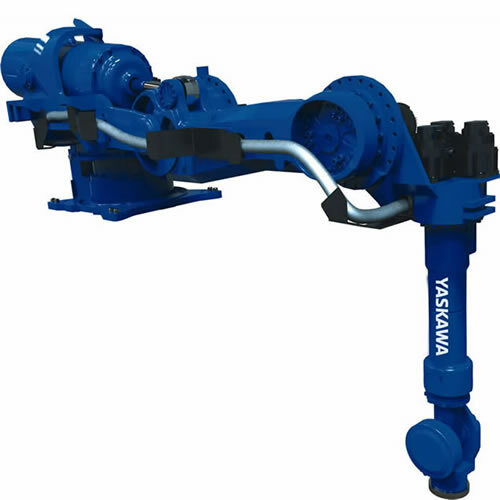 Yaskawa has developed unique solutions that maximize the benefits automation brings to the process. 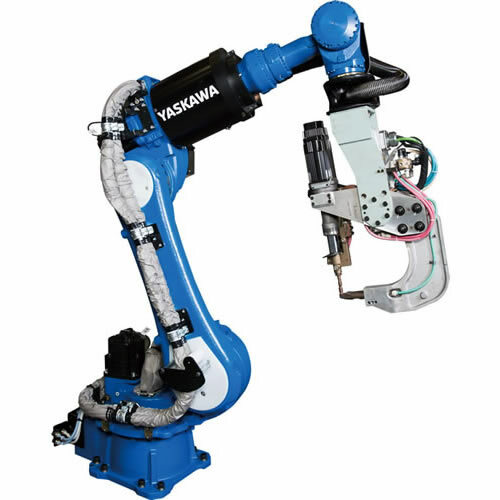 As a world leader in robotic welding, Yaskawa Motoman offers spot welding robots with a broad range of payloads, reaches, integrated spot harnesses and servo-controlled spot guns. We have collaborated with automotive OEMs to create innovative robots to improve body shop productivity. Our SpotWorld® platforms have helped manufacturers improve productivity and reduce time to market. Floor space is a precious commodity. To help conserve that floor space and reduce overall machine footprint, we introduced a series of robots designed for higher robot density. The VS100 is a unique, low-profile 7-axis robot that can be positioned close to or under car bodies. The MS80W and MS165W are slim-profile robots that can be mounted close to traditional-sized ES165D / ES200D robots. These robots can be positioned closer to the workpiece and allow the product to be produced with fewer re-spot stations. Fast and predictable product changeovers are critical to maintaining throughput. NC locators, like the UH-series robots, allow rapid seamless line change. Programmed with X, Y, Z positions, the UH robots can move body mounting pins into new locations while a different body style is being transferred into station. 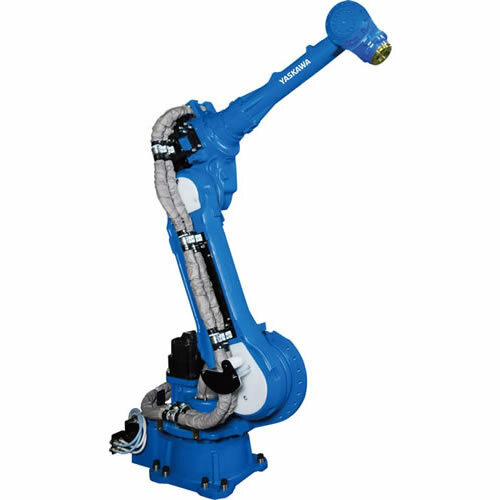 We offer an extensive line of standard robotic positioners for work holding. Our low-profile 2-axis MotoPos and 3-motor MRM2 trunnion positioners are our most popular for SpotWorld workcells. Our patented MotoMount™ system makes installation easier, improves operation, reduces bearing stress and extends the life of the positioner. Fixture utility options to the faceplate make integration/changeover easy. All of our positioners can be customized to better fit the needs of your application. We were the first robot company to develop coordinated motion of multiple robots from one controller. Coordinated motion enables multiple robots to work within the same space without the risk of one robot interfering with another. This feature allows our robots to manipulate larger parts for multiple process robots or work closely together without collisions. Coordinated motion also extends to external servo axes in our positioners, simplifying complex operations. We continue to refine our software capabilities around coordinated motion maintaining our #1 position in the industry. Our systems are the easiest to program and deliver the best application flexibility. For example, by combining material handling robots with spot welding robots we can provide "jigless" processing, resulting in more flexibility and reduced tooling costs. Up to eight robots can be controlled from a single controller. Multiple robot control has been used to allow four robots on rails to pick up and transfer a car body between stations at a conveyor transition point. We revolutionized the robotic arc welding industry with a diverse offering of standardized pre-engineered workcells called ArcWorlds. ArcWorld® cells can also combine a variety of workholding positioners, process equipment and safeguarding. These workcell configurations are easily adapted to spot welding applications as SpotWorlds, which have been utilized in a wide range of industries, including automotive Tier suppliers, agriculture/construction equipment manufacturers and medical equipment manufacturers. While we do not build the spot guns, we work with the leading manufacturers to make them lighter, more efficient and more versatile. We also ensure that the spot guns are integrated into our core controls and software, resulting in a more flexible, high-performance system. Our software provides easy calibration for X or C type guns and supports offsets for gun arm deflection and tip wear compensation. Stepped pressure files allow the gun pressure to be varied during the welding cycle or during a tip dress cycle. 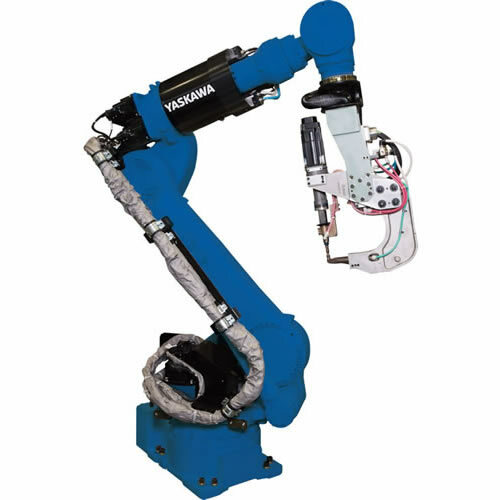 The spot welding harness supports motor and encoder cables for Yaskawa Sigma-5 servo motors, which can be integrated with the gun manufacturers drives. Control kits are available for Obara lightweight motors, Tolomatic ServoWeld actuators and Exlar actuators. The integrated spot harness greatly improves throughput by eliminating downtime due to robot harness issues. Product launch times were reduced because simulation models and offline programs could be used “as is” versus editing programs to avoid cable interference. By using mid-frequency inverters for DC welding, transformer sizes have been greatly reduced. We have also worked with gun manufacturers to utilize higher frequency inverter switching (1,800-2,000 Hz) to help reduce gun size and weight, resulting in a more efficient and smaller system. A single software instruction is used to initiate a spot welding cycle, including multiple spots in a row. A digital interface for Medar’s MedWeld 6000 MFDC weld timer allows weld schedules to be programmed from the robot programming pendant. The digital interface also provides the ability to program and monitor information from the MedWeld 6000 timer. Up to 255 weld programs are supported for each timer, and up to four timers can be networked with a multiple robot controller. Robot system is able to spot weld in tight areas on two different planes. Motoman innovations in the robotic spot welding market include ES-series "Expert Spot" robots with an integrated spot harness. With spot utilities (power, water, air, motor and signal lines) integrated into the profile of the robot arm, automotive OEMs and Tier 1 suppliers realize increased flexibility and higher uptime. Motoman’s patented multiple robot control technology allows close interaction of several arms working on a car body without fear of collision. Motoman's latest innovation is the VS100 spot welding robot. 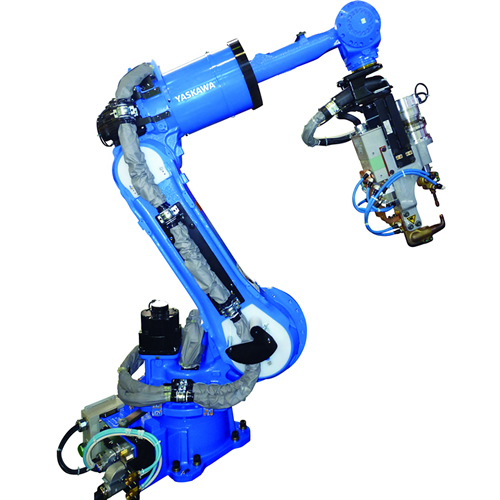 This 7-axis spot welding robot is designed to take full advantage of proven Direct Current (DC) weld timers and servo controlled actuators, Motoman is introducing a series of light weight "mini-guns.” These powerful, compact spot guns weigh less than 50 kg, but deliver high performance with 600 kgf clamping pressure and 15,000 Amps of welding current. The low profile and "elbow" on the VS100 robot allow it to be positioned close to the vehicle. It can reach underneath or inside confined spaces. 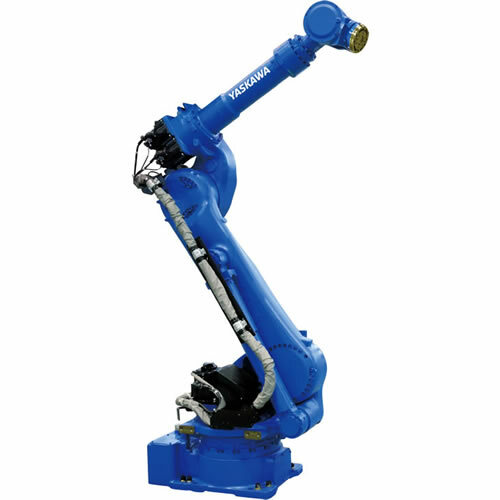 The 6-axis MS80 robot has a slim profile and longer reach for windshields and pillars. 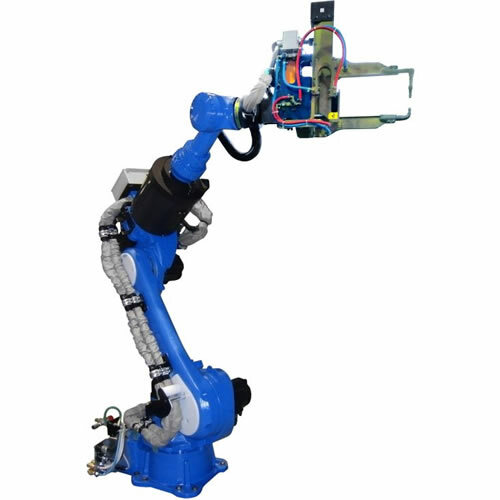 These smaller, faster spot welding robots are designed to be used with full-size ES165D/ES200D model with larger guns to maximize robot density in a welding station. This "high-density" approach reduces takt time and shortens the production line with fewer re-spot stations. SpotWorld® is a complete workcell with robot, process equipment, part positioner and safeguarding integrated together. 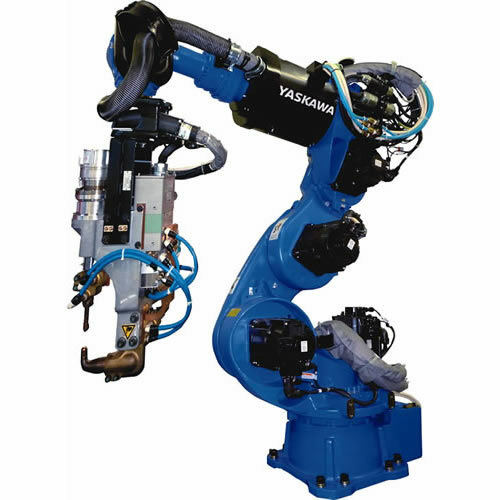 It leverages Yaskawa Motoman's "Master Spot" MS-series robots and popular welding positioners to pattern workcells after our popular ArcWorld® product line. Servo-controlled spot guns with Direct Current (DC) spot timers are synchronized to provide improved quality at reduced cycle time. 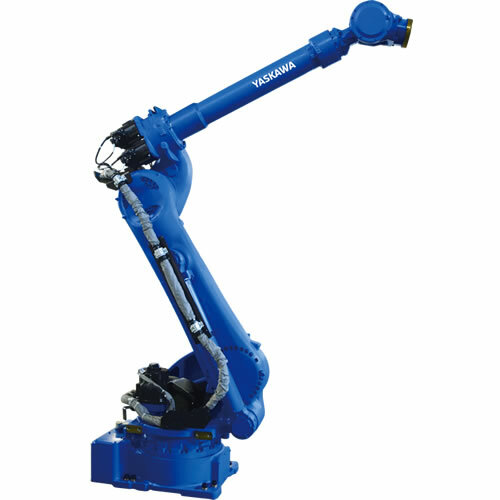 Yaskawa Motoman provides service and warranty for robots and positioners in workcell. 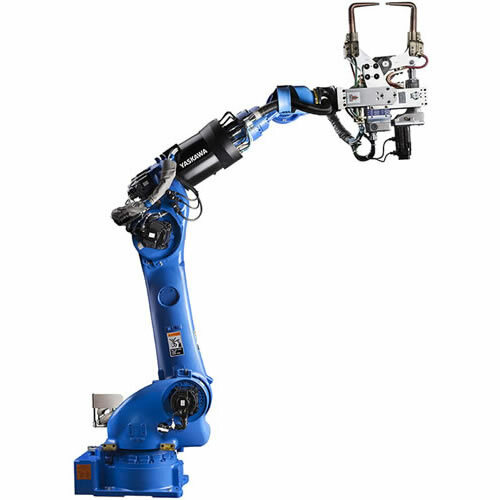 Smaller MS80W or MS120 robots reduce workcell footprint and can be combined with arc welding robots. HyperProductivity® with multiple robots in the workcell controlled from one teach pendant. Standardized workcells are easily modified to accommodate plant specifications. Cost and delivery of custom configurations is reduced by using standard components. Integrated spot harness improves uptime and application flexibility by eliminating cable management issues; one-year warranty on harness. Servo gun control improves quality and reduces cycle time by providing precise control of electrode force. Programming of Medweld 6000 timer with Medar commands from robot pendant.